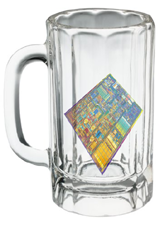 computer architecture and beer ... what could be better? Weekly meetings Thursdays, 12:30pm-2:00pm, Klaus 2100. BYO-lunch, soda+cookies provided. available to outside people. If you would like a copy of one of these papers, please refer the IEEE/ACM digital libraries or the authors' personal web pages. What the heck is Arch-Beer, anyway? arch-beer started life as a weekly computer architecture meeting at Georgia Tech. Back in the 90's it had random attendance, but eventually died of attrition when all the key people left. Upon a few new key people starting their PhD studies at GT in the 2000 time-frame, the group meeting was slowly and painfully revived. It has since evolved from a reading-discussion group more into a seminar-debate group, with mixed attendance from ECE and CoC students and faculty. Any given semester sees a wide variety of material presented, including personal research, interesting conference papers, practice conference or job talks, faculty candidate talks, and so forth. Fascinating. But why is it arch-beer? Originally it was held on Friday evenings, with rumors of beer consumption or perhaps migration to off-campus locations for the beer consumption. The current incarnation tries to get a higher density and broader spectrum of people, so it's typically held during lunch. Since GT is a dry campus, no alcohol is permitted in the buildings. We inherited the name, but lost the special magic of motivation. In lieu of beer, we now have free drinks + cookies/donuts/somethings.